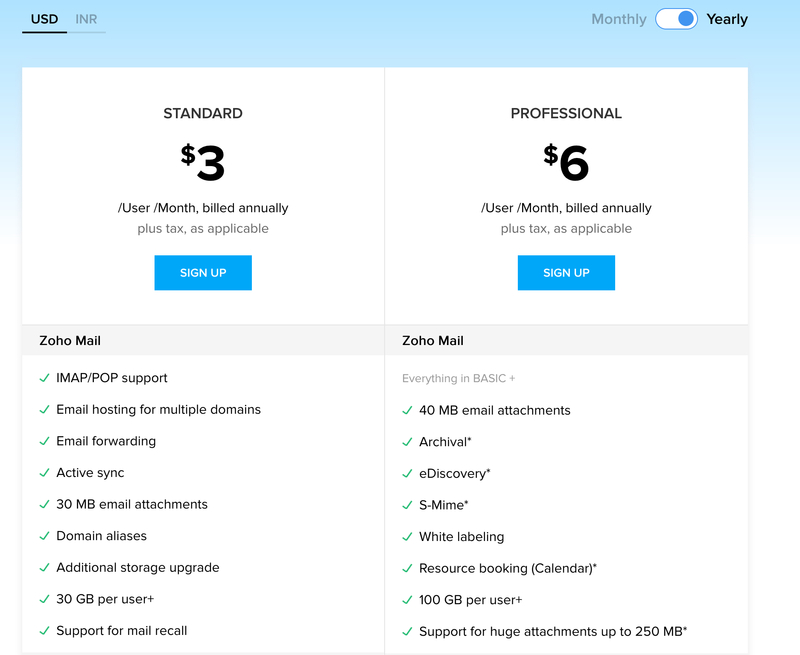 Zoho Mail - Flexible subscription and extra storage options. Zoho Mail offers flexible plans for users to choose the best plan that suits their organisation. The payment can be made online using your Credit Card. The renewals and upgrades are automatic, flexible, and charge genuinely based on the date of upgrade. Zoho offers a Workplace plan, which is a bundle comprising the Zoho Mail suite, Zoho Docs and the office suite of applications. The plans in Zoho Mail are designed to cater to the needs of organizations of all sizes. Select the option that suits your organization's requirements from the available plans. Zoho Workplace offers a free plan with 5GB storage per user for Zoho Mail and Zoho Docs. Upto 5 organization users can sign up for Zoho Workplace with this plan. It is a web only plan. In addition to this, we provide the Standard plan with 30GB storage per user and Professional plan with 100GB storage per user, each with a multitude of features, and varying storage options. You can also avail a 15-day trial version of the Professional plan. In case you are looking for custom plans for enterprise (1000+ employees) organizations, reach out to us at sales@zohocorp.com for a detailed quote. Zoho's Mail plans are intended for those who would like to use Zoho Mail for their business emailing. The Zoho Mail application does not stop with just emailing, but also has an extensive set of other applications, that include, Contacts, Calendar, Notes, Tasks and Bookmarks as well. You can choose from the two available plans, according to the needs of your organization. Visit the Zoho Mail Pricing Page for more details about the plans. The Zoho Mail Lite plan offers 5GB storage per user, with an extensive Calendar application. The Zoho Mail Premium plan provides a stoage limit of 30GB per user, with multiple other features, in addition to the features available in the Mail Lite plan. These features cater to the business needs of large organizations. Zoho Workplace provides the Trial option for all the plans. There is no need for the users to provide credit cards when signing up for the trial plans. The users can choose to upgrade to one of the paid plans before their trial ends. In case the Super admin does not upgrade to a paid plan, the account will automatically be moved to the free plan. Some of our Beta features are exclusively available only in our Professional Plan. These features are available for early access on request. Archival - Zoho Mail's Archival solution will help retain all the outgoing and incoming email along with any attachments and metadata. These emails are preserved and indexed for any future use. This is useful to protect critical data and in case of any accidental deletion. eDiscovery - This allows you to search and obtain information from the archived emails. You can create investigations on specific emails based on your requirement. S/MIME - Secure/Multipurpose Internet Mail Extensions (S-Mime) provides high-level security to your Organization's emails. This encrypts the content of the email using keys and curbs any misuse. It ensures that only authorized personnel can access your data. Zoho Mail's S/MIME is well protected against EFAIL attacks. Resource Booking - Zoho Calendar includes provisions for Resource booking. It allows the users in your organization to block meeting/ conference rooms for a specific amount of time. In addition to this, you can also create events for the meeting and send out invitations to the attendees from the Resource booking section. To upgrade to one of our paid plans in order to avail these features, refer to the next section. Refer here for detailed comparison between different plans. The Super administrator can decide to upgrade from the free to paid plan. Login to www.zoho.com/mail as the Super Administrator. Click on your profile picture on the top right corner of your mailbox, and click Upgrade. The number of licenses should ideally be equal to the number of users in your organization. During an upgrade, all users will be moved to paid plans, and there cannot be any free user or free license. All users in the organization will be under the same base plan, which will decide the base storage for all users. In case you need additional storage for selected users, you may buy storage units and apply to the selected users. Provide your card details with the correct validity, city and street address details. In case there is a mismatch in the data available in your bank, the transaction may be rejected by the bank. Your basic card details and the address details will be stored in Payment Gateway, based on which your future upgrades/ renewals etc will be processed at our end. In case you happen to change the address with your bank or want to use a different card for subsequent renewals, change your credit card details. On successful transaction, your account will be upgraded to the selected plan. In case there are any payment failures, you may change your card details and retry. When you subscribe to paid plans, the number of users should be equal to the number of licenses. To add more users, you need to purchase licenses. The Super Admin can purchase licenses anytime, from the Control Panel. When you are in annual renewal mode, the additional licenses purchased will be charged on a pro-rated basis. Suppose you have 6 user licenses and you go for 1 new license after 6 months, you will be charged for the additional license, only for the remaining 6 months based on the date of renewal. The upgrades/ additional licenses subscribed in the middle of a payment cycle will be charged rounded off from the date of purchase, and up to the immediate renewal date. Login to https://mailadmin.zoho.com as Super Administrator. Click on your Profile picture on the top right corner of your mailbox, and click the Subscription button. The complete plan details will be displayed. 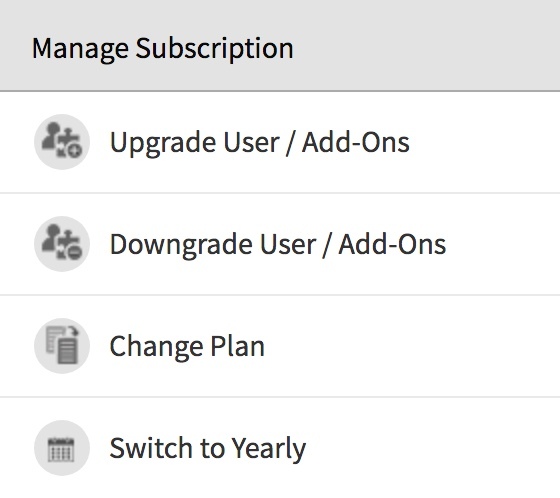 Next to the plan details, in the Manage Subscription section, select Upgrade User/ Add-Ons. The number of users and the pro-rata amount based on your renewal date, which will be charged to the card during the upgrade, will be displayed. The renewals for the organization occurs on a single date and hence the current charges will be based on the next renewal date. In case the transaction could not be completed, check your card details saved with us. Email is not just a mode of communication but serves as a track of previous important communications which you may have to refer from time to time. The storage requirement for each user varies based on the user's email behavior, the nature of the job and other communications. Zoho Mail provides various basic storage options, based on the plan of the organization, same for all users. However, some users may need more space for email due to their job requirements or their nature of work. In case a user needs more than 200 GB, the admin can buy multiple add-on storages and allocate to the same user. The administrator can allocate the licenses and the storage for the users from the Mail Storage page. Go to the Mail Storage section. For each user, the base plan will be allocated by default. Click the edit icon next to the Additional storage, to view and allocate the available additional storage units. The basic storage will be displayed. Provide the additional storage required for the account and check the total storage allocated. Click Save to allocate the add-on storages to the account. You can select 'Reset all add-on storage to zero', to revert the allotted storage to the basic storage itself. The complete plan details will be displayed. Next to the plan details, in the Manage Subscription section, select Switch to Yearly. After you've chosen this, in the Confirm Order screen, you will be shown a summary of your bill amount. Click Proceed to Pay and finish your payment. You will now be moved to the yearly plan. You can modify the credit card details stored with us, for other future upgrades or renewals. Follow the steps below to change your card details. Click on your display picture on the top right corner of your mailbox, and click the Subscription button. In the top right corner, click the ellipsis (three dots) to view the menu options. Select Billing Details, and choose, Change Card Details. Provide the new card details and save. You can also update the Billing Address, by selecting the 'Change Address' option. You can view the details of your past payments like upgrades, renewals etc. from the Payment History section. The invoices of each payment made is also available in the same page. Login to www.zoho.com/mail as Super Administrator. In the top Right corner, click the Settings icon. Select Payment History to view the past changes in plans, payments, and renewals. You can search the transactions or filter the details from the list of transactions. You can click the PDF to download the invoice in pdf format. Zoho Workplace/ Zoho Mail supports multiple payment modes and offers secure transactions. Our billing system is transparent without any hidden costs or charges for the administrators. You can pay through any of the following cards. You can also pay via Paypal, Bank transfer. Please reach us at sales@zohocorp.com for any further details. You can cancel and downgrade to free plan to stop the further renewal of your subscription and to continue in the free plan. Follow the steps below to cancel the subscription. From the Manage Subscription section, select Change Plan to view your current plan and the other options available. Scroll below the plan details displayed, to view the Cancel Subscription link. Select Click here to cancel your subscription link at the bottom of the page. This will cancel the subscription and move the organization to the free plan.